On March 14, Michigan Governor Rick Snyder announced the appointment of Kevyn Orr, named last year as one of Washington DC’s top bankruptcy attorneys by Washingtonian Magazine, as an Emergency Financial Manager for Detroit under Public Act 72. Essentially this puts Detroit in receivership. Detroiters marching against Lansing’s imposition of an Emergency Manager. This position, created under a Michigan law that many Michiganders believe is a figment of the state government’s imagination, will be converted into an Emergency Manager once Public Act 436, passed during the lame-duck session after an earlier EM law was voted down in the November 2012 election. The EM law that was passed in March 2012 was suspended once the referendum signatures were submitted last summer but the Governor and legislature claimed this revived Public Act 72. However, that was a hotly disputed interpretation! Nonetheless six Michigan communities—Allen Park, Benton Harbor, Ecorse, Flint, Highland Park, Pontiac, all formerly industrialized working-class towns, and except for Allen Park with heavy majority African-American populations—and three school districts—Detroit, Highland Park and Muskegon Heights—operated under Emergency Managers who then became EFMs and will once again be converted into Emergency Managers when Public Act 436 takes effect March 28. With the addition of Detroit, nearly two-thirds of the state’s African Americans will be under state oversight. Orr is an African American with an unflappable personality. Appointed by a Republican Governor, he is a Democrat who will be paid $275,000 a year by the state under an open-ended contract. His “incidental costs” in order to relocate to Detroit and perform his duties will be privately raised, according to State Treasurer Andy Dillon (a career politician and also, incidentally, a Democrat). Orr has resigned his partnership in the prestigious Jones Day law firm. As an expert in restructuring and bankruptcy, he represented Chrysler in its 2009 bankruptcy and pointed out how successful Chrysler has now come roaring back. At the press conference where Orr was introduced to the city by Snyder, he exhibited confidence in being able to turn around Detroit. He called his job being in “the Olympics of restructuring,” but stated that with cooperation he could accomplish his task in as little as three to six months. This is an amazing boast given the structural problems of Detroit. Flint, for example, has been in state receivership since 2002! Given Detroit’s long-term liabilities of approximately $15 billion — with $600 million a year in debt service to banks and $5.7 billion in city retirees’ health care benefit — the press asked if Orr was going to take the city through bankruptcy. He said he didn’t want “to pull out that cudgel unless I have to.” To avoid that process, Orr proposes negotiating with the city labor unions, vendors and bondholders. Once Orr’s powers are extended when Public Act 436 takes effect, he can be the sole negotiator with unions over collective bargaining. He can reject or change existing contracts, consolidate or eliminate city departments, hire consultants, contract out services and even sell off city assets with the approval of state government. However many of these have already taken place under city government and the consent agreement city government signed with the state last year. Management of the Detroit Department of Transportation was contracted out by Mayor Dave Bing in 2011 and has since been subcontracted. The Public Lighting Department is undergoing a seven-year transition to turn its customer base over to DTE Energy. The department is already buying all of its energy — instead of upgrading its own facilities. Part of the transition includes reducing 88,000 street lights (58,000 operational) to 46,000. According to the plan, the more “distressed” areas of the city will retain only 30-40% of their current number. The Detroit Water and Sewerage Department, built over 150-year period, operates a fresh water and discharge system to the city and suburbs. A report commissioned by the department last summer called for outsourcing billing, maintenance and other functions and reducing its work force by over 80%. Yet no-bid contracts are rewarded while there is has been little to no worker/community review. The Detroit Water and Sewerage Commission, which has been turned into a regional body, just issued a “Final Compliance Report” in order to end the federal oversight that has existed over the last 35 years. The report recommends turning the department into an independent public authority supervised by regional commissioners. The Department of Human Services has been turned over to Wayne (county) Metro Community Action Agency, whose board members mainly reside in wealthy suburbs. The Planning and Development Department is being run by the quasi-private Detroit Economic Development Corporation. Federal and state tax collection returns fewer dollars to cities these days. At the federal level the military budget and the war on terrorism absorbs more than half of the annual budget. At the state level, Michigan is mandated to share its tax collection with municipalities and counties. One stream of revenue sharing is constitutionally guaranteed but the other portion is statutory. Since 2001 state tax collection has declined about four percent but the fiscal decline has been used to cheat municipalities out of their fair share of revenue. Between 2001 and 2010 Detroit lost about $450 million. While state tax revenue declined four percent during that period, the Michigan Municipal League pointed out that payments to Detroit dropped 28%. Beginning in the early 1950s corporations moved plant operations to the suburbs and beyond, and many Detroiters followed. We are now a city of less than 700,000 with 40% of the 140-square miles vacant. More than 70 sites are toxic waste dumps. Since 1999, with the first state takeover of the public schools, the city has only had control over the school district for two years. Schools have been shut down; charters have mushroomed along with the school debt. Services have declined while taxes on home properties have not been decreased nor mortgages brought into line with their market value. For example, last summer the Occupy Detroit Eviction Defense Committee organized a four-week vigil to prevent the sheriff for evicting a family whose mortgage was valued at $140,000 while it was assessed for market value of $20,000. Unless a family is willing to carry out a public campaign against the banks and Fannie Mae, the government agency that backs them, they usually end up abandoning the house and creating one emptier house in the neighborhood. It then gets stripped by professional thieves. While Governor Snyder and newly appointed EMF Kevyn Orr claim they will move to generate community cooperation by getting buses running on time and fixing the broken street lights and by having quicker response time from police, fire and emergency service, the reality is that they will not develop a jobs program — in fact, they will continue the policy of laying off public sector workers. Just as in other countries facing austerity, Detroiters will be expected to have fewer services and more low-wage jobs. More than a third of city residents live in households with an income below the poverty line. What will cutting retiree benefits do for the 11.5% of Detroiters already retired? It will decrease their ability to access health care and reduce their quality of life. What Governor Snyder and EMF Orr could do in addition to developing a jobs program — cleaning up toxic waste dumps, renovating and weatherizing buildings and converting closed plants into developing non-fossil energy sources — is to call public meetings so that residents can review the budget and understand the nature of the deficit. Let there be a people’s audit, where one of the obvious demands requires banks take a haircut. One example: according to a 2011 public filing, Detroit had $3.8 billion in outstanding variable interest-rate swaps. These were sold to the city in a series of transactions beginning in 1997, supposedly to hedge interest-rate risk. Clearly Wall Street sold public officials a bill of goods and now we are expected to pay for this robbery. Such an odious debt should be repudiated, not paid back with interest to boot! Although the Detroit City Council fussed over the imposition of the Emergency Manager, the majority—along with Mayor Dave Bing—have now decided to join the Orr “team.” Orr will try to sweet-talk residents; the foundations that support the Emergency Manager (and charter schools) and have roots in neighborhood associations and urban gardens will do their part to back him up. Clearly resistance must come from below. The National Action Network has taken a lead by calling an action the day Orr was appointed. 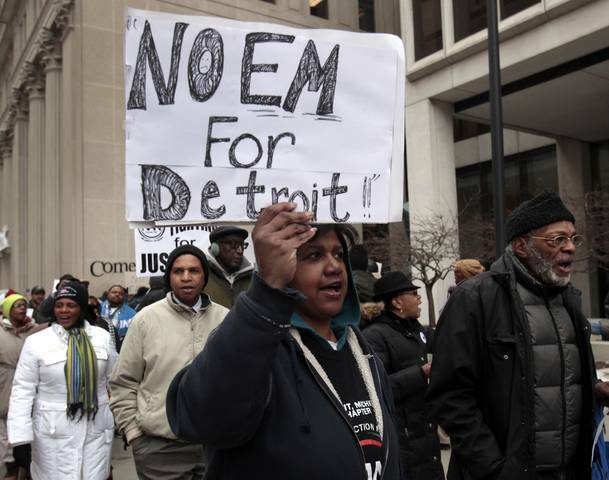 A union-sponsored action will confront the Governor when he returns to Detroit March 18. But much more is needed than symbolic actions. Many union members were very angry that the day right-to-work-for-less passed in Lansing, Jimmy Hoffa and Bob King only called for turning the scoundrels out of office in 2014. Why not use workplaces as organizing centers and move toward collective action? Occupy Detroit Eviction Defense Committee will be demonstrating at noon Wednesday, March 20 in front of the Wayne County Treasurer’s Office, 400 Monroe, in Detroit’s Greektown. The following day the action will be at the Michigan State Housing Authority Office, State of Michigan Building, 3028 W. Grand Blvd., Detroit. These demonstrations will link the Detroit debt to tax foreclosures. The reality is that the State of Michigan holds $204 million in federal Hardest Hit Homeowner funds for homeowners to pay off delinquent property tax bills so there is no excuse why any homeowner should lose his/her home to a tax foreclosure—but 42,000 are scheduled for tax foreclosure in 2013. After a home is foreclosed, Wayne County sells it at an auction for a fraction of the amount owned however the full amount is charged to the city. This year alone Detroit will pay out over $80 million in these charges. So stopping tax foreclosures will aid homeowners, stabilize communities and save Detroit millions of dollars. The solutions to Detroit’s problems are in front of us. Dianne Feeley is a retired autoworker and editor of Against the Current. She lives in Detroit. You can easily find on the web slot machines, roulette, video poker in addition to huge jackpots at the online gambling that is specially catered just for online betting gamblers with big cash deposit bonuses and big prizes. Betting is a lot more rewarding at this specific online playing internet site compared to alternative on-line betting sites and perhaps they are really enjoyable and intriguing at the same time. Very informative! Nicely done, Dianne. I find it galling that helping a company restructure–Chrysler, which Orr worked for in 200–is being likened to saving a failing city. A company is beholden to its shareholders and has no qualms about ripping off its workers, which Chrysler and Orr did in spades. A city is not a profit-making entity that’s supposed to put profit above all else. It has not only workers but residents. This is all obvious, and yet Orr’s experience as a manager of Chrysler’s bankruptcy is touted as fitting him to save Detroit.